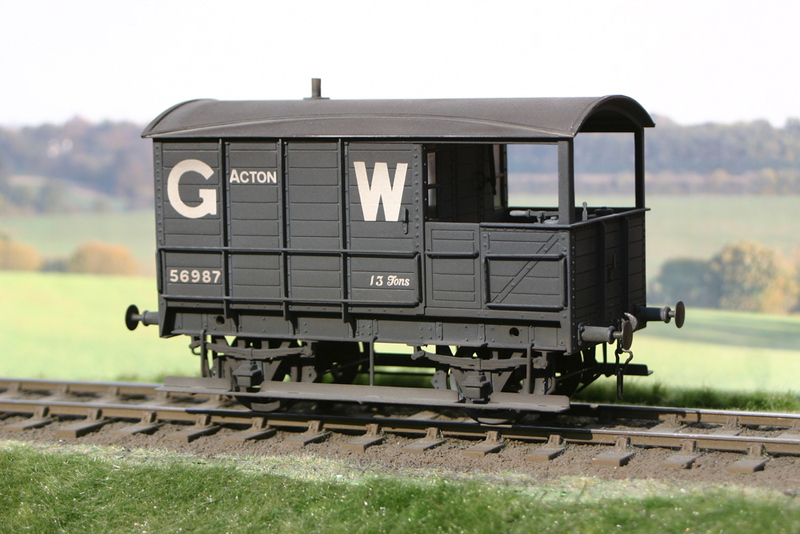 GW goods wagons part 2; The AA7 ‘Toad’ brake vans. Twelve examples of the Great Western’s 13 ton AA7 brake vans were built between 1897 and 1898 to Lot 206 for working the company’s trains from Acton over the Metropolitan and (for a short stretch between Farringdon Street and Aldersgate Street) the Widened Lines to Smithfield – they were numbered in the series 56985-96. Essentially they were a short version of the AA3 vans with a 9ft wheelbase, measuring 16ft over headstocks with a proportionally smaller verandah than the larger vans. It has been suggested by various authors that the AA7s must have been the among the first fitted brake vans on the GW because of the Smithfield meat trains, which included fitted Micas, but in reality, the perceived volume of meat traffic to Smithfield has been blown out of all proportion, and careful study of the relevant WTTs show that in fact the meat trains made up only a very small percentage of the traffic over the route as Smithfield was also the main general merchandise goods depot for central London and the City. To put things in perspective; in 1912, out of sixteen daily goods trains only four were scheduled for meat traffic, and of these, three were mixed trains of meat and general merchandise. Quite surprisingly, only one single trip each day was solely reserved for the conveyance of meat. It’s worth remembering that Mica’s were vacuum braked to convey chilled and frozen meat between Birkenhead and London at passenger-rated speeds, and it would have been the brake vans on those trains which were first vacuum fitted. It wasn’t until later, maybe much later (post-Grouping?) that vacuum braked stock was required on the Smithfiled trips. The model is from Big Jim’s wonderful Connoisseur range, and the only major deviation I made was the addition of WEP compensation units rather than a solid chassis. GW paint from Precision, weathering from Humbrol and transfers from the HMRS. Glazing is 0.13mm glass, instanter couplings from CPL and sprung buffers from Slater’s. This example was built to commission, and is in 0 Finescale, but I have a pair to build for Basilica Fields where meat traffic not only shuttles between Acton and Smithfield, but east from Smithfield to St. Katherine Dock via Basilica Fields on the (Middle) Circle Extension. No photoshoppery…well, just a little to get rid of a couple of specks of dust, but the colours and lighting is au natural care of the fat old sun. I recently chanced upon the rather unique Spitalfields Life blog, the (gentle) author of which has committed to write one post a day until 2037 – a task which seems to me to be a very tall order, but kudos if that comes to pass! Covering not only historical, but contemporary life stories of the area, by far the greater proportion of posts are largely irrelevant in the context of Basilica Fields, but nevertheless are usually interesting, and the writing style always engaging, so I’ve bookmarked it as one of my ’10 minute coffee break browses’ as I work back through the archive of posts. Some posts have an immediate air of relevance for us here, others appear less so at first glance, but on closer examination are a treasure trove. A fantastic example of the latter is a post on photographs of car crashes at Clerkenwell during the late 50s – a somewhat dark and macabre theme one might think, but actually that’s not the case, and there’s a tangible, attractive atmosphere to the remarkable images. However, as I scrolled down through the post the last thing I expected to see was a number of photographs unintentionally detailing not only the civil engineering of the Met & Widened lines in the vicinity of Ray Street Gridiron, but a number of the old buildings on the periphery too. Perfect! For the connoisseur of old Victorian and Edwardian photos, the posts here, here and here give an interesting insight to not only the East End, but other parts of the sprawling Metrop. You can click a number of these images to enlarge, then click to enlarge further. Or ‘cartage’ by another name. Basilica Fields is set in the period 1890-1905 at which time options for the transport of goods were limited to canal, rail and road with movement on the road being mostly by ‘horse and cart’. So in the late Victorian era goods traffic was moved between towns (or village, or city, or colliery or dock…) by the railways at a fine pace…and then delivery to customer’s premises would be dependent upon how fast the horse would go whilst pulling a loaded lorry. Whilst the GWR, in common with many other railway companies, used steam lorries for heavy loads, the use of petrol /diesel power for mechanisation of the collection and delivery of traffic was not viable in the Basilica Fields timescale. We prefer to leave such advances to be hidden in the mists of time – or the depths of a London pea-souper. Back to the topic… This journal has introduced previously the subject of Artillery Lane and the GWR Goods Depot at Gun Street, a small depot which acted as a satellite to the GWR depot which served Smithfield Market. In truth the East End of London seemed to be awash with goods facilities for some of those railway companies which served London – try ‘Town And Country’ Vol. 1, (Irwell Press) for a map showing the coal, grain, potato and general merchandise depots and yards to be found within a few miles of Fenchurch Street station. Artillery Lane is the first part of Basilica Fields to be described in detail so far; there are many more locations to be described in the journal and some of those locations include goods facilities such as coal drops, warehouses and docks…mostly served by the Great Eastern Railway. Which means that the streets, yards and depots of Basilica Fields will feature a wide range of railway wagons (to carry the traffic to / from the sidings) and an equally wide range of horse-drawn lorries, vans and poles. Each location in Basilica Fields will illustrate the handling of specific traffics and the horse-drawn vehicles will be those appropriate to the traffic and the railway company. So, for example, the traffic which is handled at the Gun Street depot requires horse-drawn vehicles of the type(s) which the GWR developed for it. In addition to the horses and the horse-drawn vehicles, the cartage services dictated that the railway company provided ‘bed and breakfast’ for the horses, and so Gun Street is provided with stables and a provender store – which is cue for two specialised traffics, being provender in and manure out. As a description of the horse-drawn lorries and vans for Gun Street requires an understanding of the traffic through that depot, then the GWR Cartage Services for Gun Street Depot starts with details of goods received and dispatched. This post is by way of a place holder for a subject which is proving difficult to crack… that is:- how did the Metropolitan Railway arrange the switch and crossing work for their permanent way. If the short and snappy title of the post leaves you a tad puzzled then the subject of this post is the way in which the Met. Rly. arranged the rails, chairs and timbers for the turnouts. At this point, after more than six months of research into the topic, we have to say that we know very little about Met. Rly. turnouts in the period 1885-1905 and much of what we understand about the subject has been provided in anecdotal form – primary source material is noticable by its absence. The recent comment by Kit Williams prompted me to look for a copy of the book which was mentioned in the first paragraph, “A History of the Metropolitan Railway – vol. 1”, (Bill Simpson, Lamplight Publications, 2003, isbn 1 899246 07 X). First port of call when searching for railway titles is the “Railway Collection” of Hampshire County Council – a collection of circa 10,000 volumes which has its origins in the library of the Eastleigh Railway Institute. The collection is housed in Winchester Library and the majority of the items are available for loan; Hampshire Libraries provides an on-line search facility which includes the railway collection, a couple of minutes work with the keyboard informed me that the required book was available “on-the-shelf”. The photograph on page 28 is known to Adrian and I, we have a copy of the image from an unknown source. Whilst the photograph is out of copyright we are not sure as to the situation regarding reproduction of this image and hence its absence from this journal. Suffice to say that the photograph is one of only a handful of images of Met. Rly. turnouts in the pre-electrification era and hence is key to our modelling of that aspect of Met. Rly. permanent way. For those who are interested in the subject, the London Transport Museum has an on-line photograph collection and one of those images shows the same junction from a different position. So thank you to Kit for prompting a start on this subject…. We left Quirky Query 2 with some photos of a GWR rail chair (in my care) and the question… “is the chair an example of the type for the 86lbs rail of 1882 ?”. None of the comments on that post have provided a definitive answer… rather those comments have deepened the puzzle. In the meantime, Adrian and I had concluded that the sidings in Gun Street depot were subject to frequent renewal and so the model shall portray the GW PW of the mid 1890s rather than of the early 1880s. However, the comments to Quirky Query 2, combined with new photographs, suggested that there is more to the original post than was thought. In taking this story forward, I am glad to acknowledge that the comments on QQ-2 awakened a recollection as to where I might find some contemporary material. A recent bright and sunny day provided the ideal opportunity to do some detective work and the results are presented here. 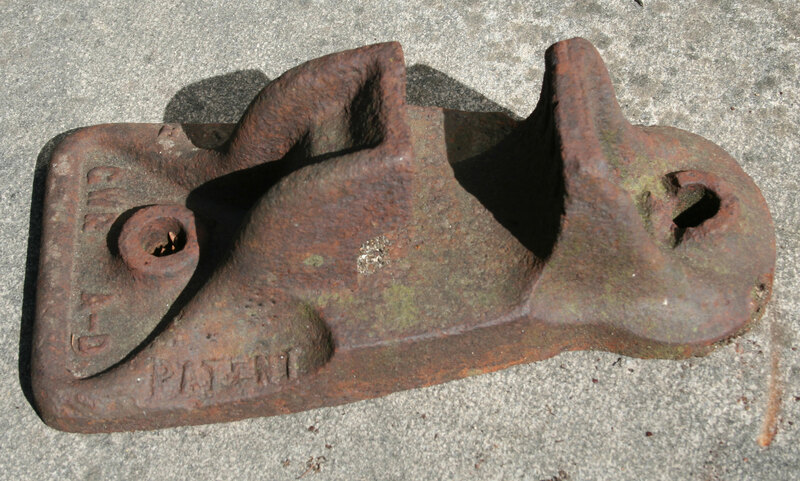 Our railway “heritage” sites provide railway historians with many opportunities to study artefacts from an earlier age and none more so than with bits and pieces from the railway infrastructure – in this case the simple rail chair. At one particular heritage site an unknown person has “collected” examples of chairs from a range of pre-group companies…. and that collection includes a couple of chairs which are very similar to my example. The photographs below show an example of the type with raised rather than recessed lettering – just as predicted in a comment to QQ2. The first photograph shows a side view of the chair – with the word “patent” visible in raised letters. 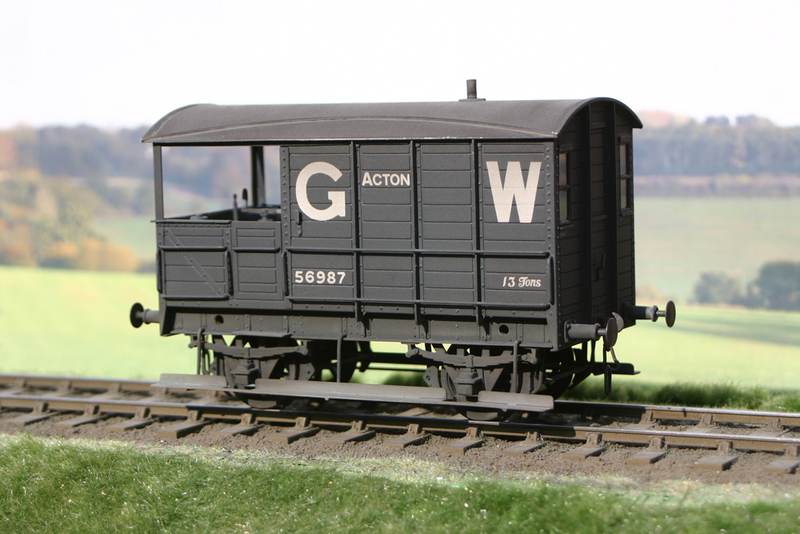 The second photograph shows an end view – with “GWR” and “A-D” in raised letters. I hope that a reader can explain the significance of “A-D”. In passing, note the grooves to the inner face of the far jaw… a feature which is discussed later in this post. The third photograph is another side view – and shows yet more raised lettering,”Mc K & H” which I feel is likely to be McKenzie & Holland (a signalling contractor). The Malvern Industrial Archeology Circle website offers an outline of the history of Mckenzie & Holland where the origins of the signalling manufacturer is recorded as “Thomas Clunes”, iron and brass founder of the “Vulcan Iron Works” in Worcester. McKenzie & Holland as a company name dates from the mid-1870s which means that the chair in the photograph is post circa-1875. What aspect of the chair is the subject of the “patent” is not yet known to me. Returning to the chair in the original QQ2 post, the similarities between that chair and the casting above are very strong, the only significant differences are the lettering and the manner in which the lettering is represented – comments to QQ2 noted that raised letters are easier than recessed letters for cast items… and that the “pattern” for the chair casting was likely to have been made as a metal item (from a wooden master with double shrinkage allowances). 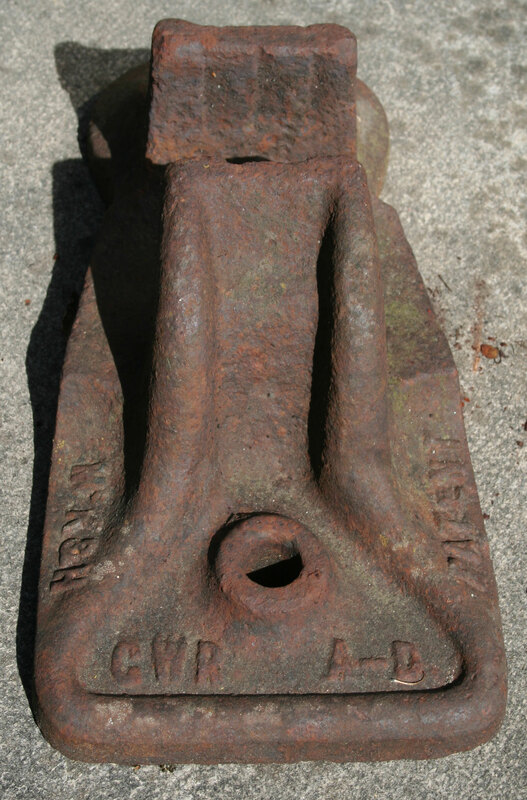 In the absence of any information about the nature of either the “patent” or the business relationship for supply of castings – the possibility exists that the GWR bought the patent-rights from McK & H and thereby gained a metal pattern for the cast-iron chair. Removal of the raised lettering on the metal pattern would be fairly easy – building up new lettering would be difficult and hence one can suggest that the new lettering was “engraved” into the metal pattern hence the recessed lettering on my chair. 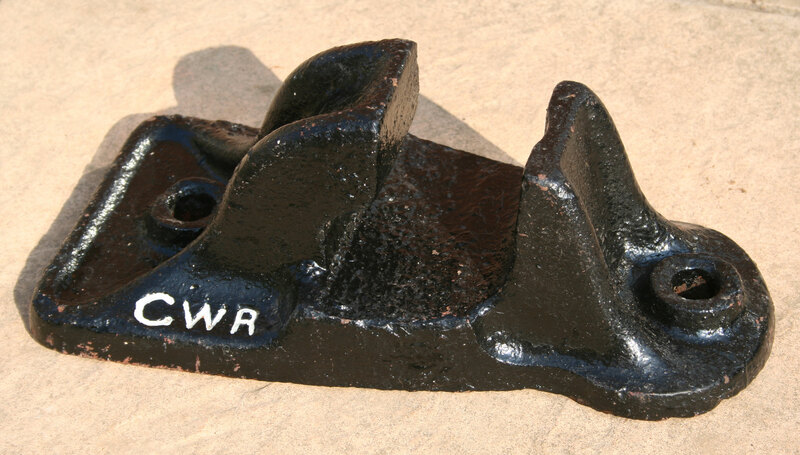 As for the vertical grooves in the jaw, Harvie (1898) records that the GWR had been experimenting with spring clips as an alternative to oak or teak keys. The relevant text refers to a circular spring clip being inserted into the space between the jar and the rail with the ends of the clip bearing on the rail. Whilst not conclusive the grooves on the face of the jaw may be related to the use of such clips. 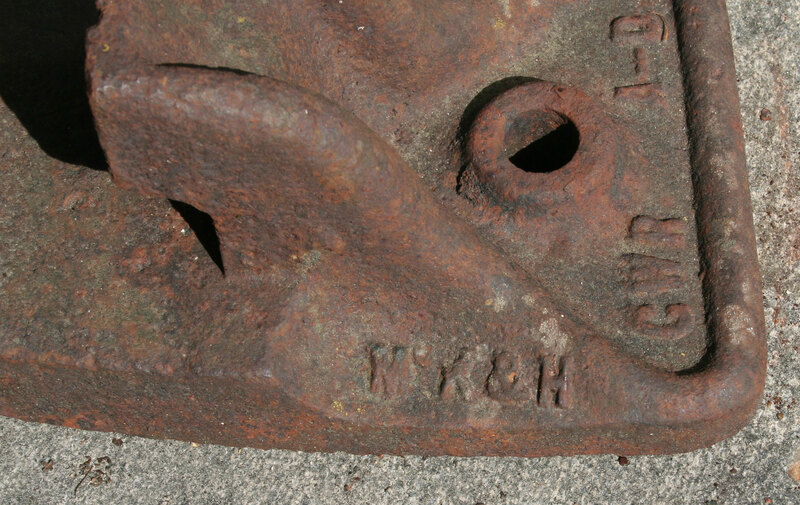 Unfortunately none of the above furthers the case for the original question… however, the similarity of my chair to the McK & H specimen puts the likely date of casting as contemporary with the introduction of the 86lbs rail in 1882. Many years ago I was asked to collect a “package” for a fellow S7 modeller… he had won an E-bay auction and the buyer had requested collection for the “package” weighed around 90-100 lbs.. When my friend called to collect his “purchase” I was shown what I had collected – two cast iron rail chairs. One of the chairs was from the L&NWR and has no relevance to this journal. The second chair was from the Great Western Railway and my friend suggested that I might like to retain the item and that is how I came to be the custodian of a (very) small part of GWR history. I have tripped / fallen over the GWR chair so many times in the last few years without giving any thought as to the part which it might play in the alternative world of Basilica Fields… and ‘Quirky Queries’ owes its inclusion in this journal to yet another encounter between my toes and that immovable object. Some weeks after the Permanent Way of the Great Western Railway for Gun Street depot (part 1) was written I came across the chair again and this time the lettering on the base attracted my attention. There are several collections of railway chairs at different “heritage / preservation” centres and most of those chairs have raised letters / numbers on the top surface of the base. In general, the letters /numbers give information about the relevant railway company, where and when the chair was cast plus an indication of the chair type (for example:- plain line chair, switch chair, crossing chair… ). However, this chair does not conform to the norm for the only markings on the chair are “GWR” and “86”, markings which appear to have been recessed into the casting. Now it is possible that the chair dates from a time when the “normal” expected details were not included on the casting. However, the general size and shape of this chair suggests that it pre-dates the style of chair shown in the drawings of the Permanent Way of the Great Western Railway for Gun Street depot (page 2). 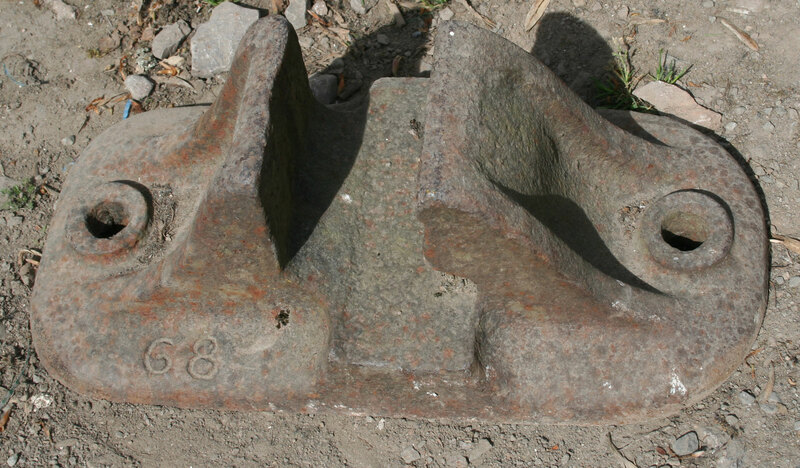 So, do the photos show a rail chair for the 86lbs per yard rail which was instroduced in 1882? Part 1 of this topic introduced the background to the permanent way of the Great Western depot at Gun Street by way of a summary of primary sources and an indication of the type of track to be found in the sidings of the depot. 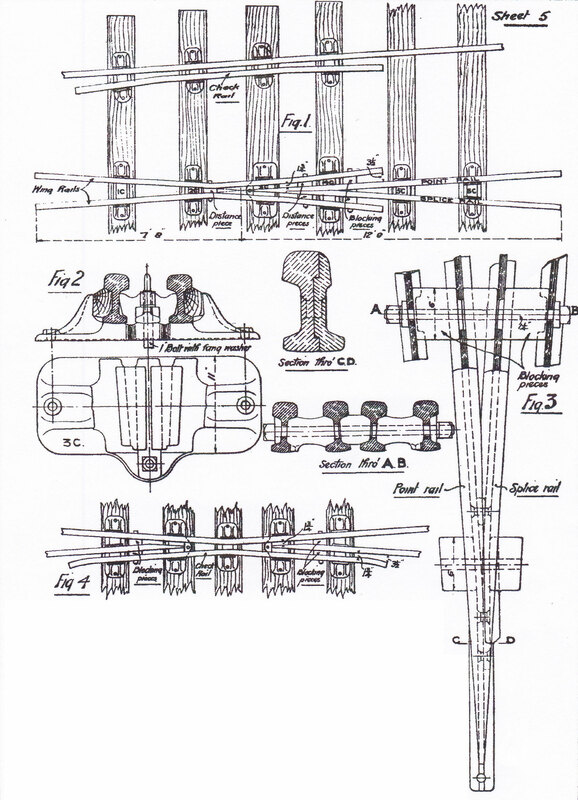 This post expands upon the summary of part 1 by describing the PW and the Switch and Crossing fittings and by including some relevant drawings from the GWR Engineering Society pamphlet “Some Notes on Permanent Way” (Harvie 1898). To recap; the Gun Street depot was opened circa 1880 and at that date the permanent way of the Great Western “narrow gauge” could, maybe unkindly, be described as ‘lightweight’ with rails of 86lbs per yard (Bowler 1923). The damp and acidic atmosphere in the Metropolitan Railway tunnels caused excessive corrosion and wear of the rails, in some locations the track deteriorated so quickly that the Metropolitan Railway replaced the rails every 2 to 3 years. Whilst traffic over the Inner Circle Extension was far greater than the traffic in Gun Street depot, the rail conditions were such that the shunting engines slipped frequently, and as a result the GWR had to replace the rails more than once in the 1880s and 1890s. 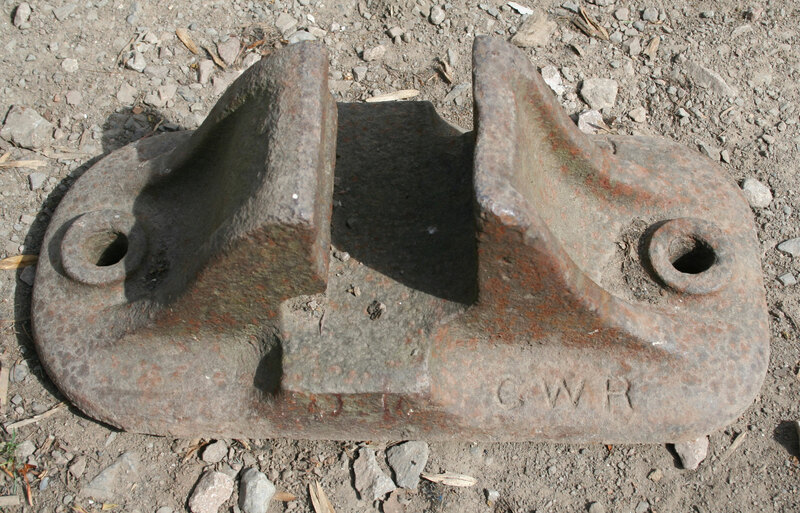 The GWR increased rail strength progressively with a rail of 92lbs per yard section in 1894, a 95lbs rail in 1897 and a 97 1/2 lbs rail in 1900. 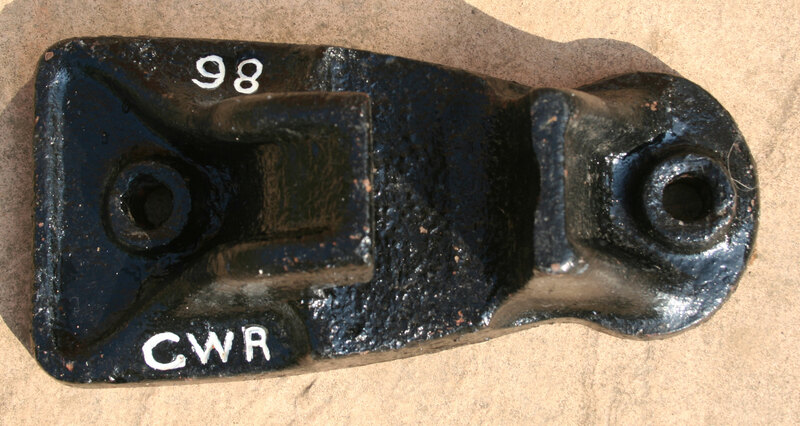 Apart from an increase in the width and depth of the rail foot from 86lbs rails to 92lbs rails, the sections of the 92lbs, 95lbs and 97 1/2 lbs rails are very similar and difficult to distinguish in photographs. By the mid 1890s the original 86lbs rails in the Gun Street depot had been replaced by a stronger rail and the change in the dimensions of the rail foot dictated that the chairs (and sleepers) were replaced at the same time. By the mid 1890s the permanent way had been re-laid from the formation upwards and reflected contemporary GWR PW practice. GWR plain track of the mid-1890s used 32ft rails of 92lbs per yard carried in cast iron chairs with 12 sleepers per rail length, except where the formation was soft, then an extra sleeper per rail length was introduced. Much of the ground in the vicinity of the the Inner Circle Extension, including Gun Street, was old marsh land, so naturally the GWR used 13 sleepers per 32ft rail throughout the sidings. Standard sleepers were 9ft long, of 10in x 5in section and made of Baltic redwood fir, the sleepers were treated with creosote before the chairs were fixed by fang bolts. 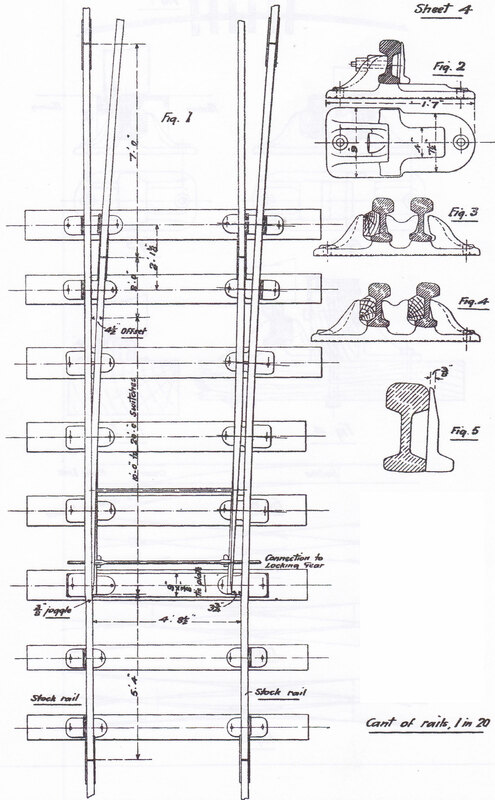 The arrangement of a plain track panel with 32ft rails is shown below. The GWR standard plain chair of the period was of cast iron and weighed circa 46lbs. Keys to retain the rail in the chair were made of oak or teak… and handed. 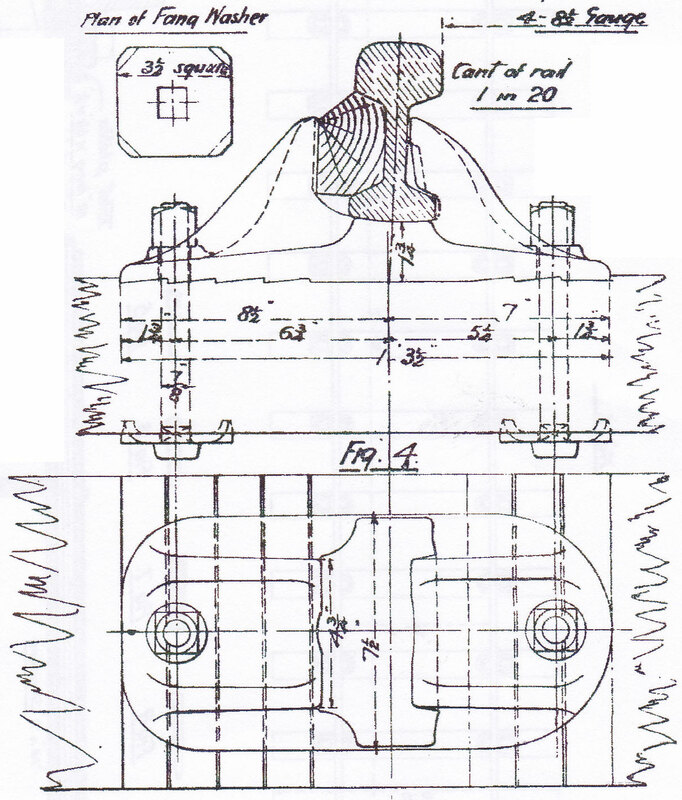 A drawing of the standard chair, with fang bolts, nuts and washers, is shown below. The arrangement of the common crossing for simple turnouts requires special chairs and fittings to hold the crossing vee and wing rails in alignment. The GWR had a range of special chairs for the various crossing angles and each chair type was used at a specific position relative to the crossing nose. In the 1890s those chairs were referred to as the 1C, 2C… 6C chairs although nomenclature changed later. At this time the chair under the crossing nose, referenced here as the 3C chair, was a casting – the nose of the vee slid into the casting and was retained by a vertical bolt through an extension of the nose. Some of the special chair types are shown below. As with the range of common crossings with different crossing angles the GWR had a range of switches of different lengths. The switch rails varied in length according to the radius of the turnout… the greater the radius the longer the switch. In the period of Basilica Fields the switch blades were available in lengths from 9ft up to 20ft where the length is measured from the tip of the switch to the point at which the switch rail has attained the “4 1/2in offset” from the stock rail – the switch rail extends for 2ft beyond the “4 1/2″ offset” and the extra length is supported in the heel chair. The switches of a simple turnout are shown below. The next part of this topic is to cover the construction of some plain track for the sidings and the catch point where the sidings join the Inner Circle Extension of the Metropolitan ‘Main Line’. After publishing the first version of this post, and subsequent to the comment from Alan Woodward, I have been able to photograph an example of a chair as shown in Harvie’ s paper (drawing sheet 1, fig. 4 – illustrated above). Of interest given the comments on this post and on a recent Quirky Query is that the chair has recessed characters and the number “68” (which may refer to the “68d section”, 86lbs per yard, which was introduced in 1882). GWR Chair similar to Harvie fig.4 showing "GWR"
GWR Chair similar to Harvie fig.4 showing "68"